The death toll in the ship capsize in Yangtze River, China's worst shipping disaster in 70 years, rose to 434 after two more bodies were found on Monday. 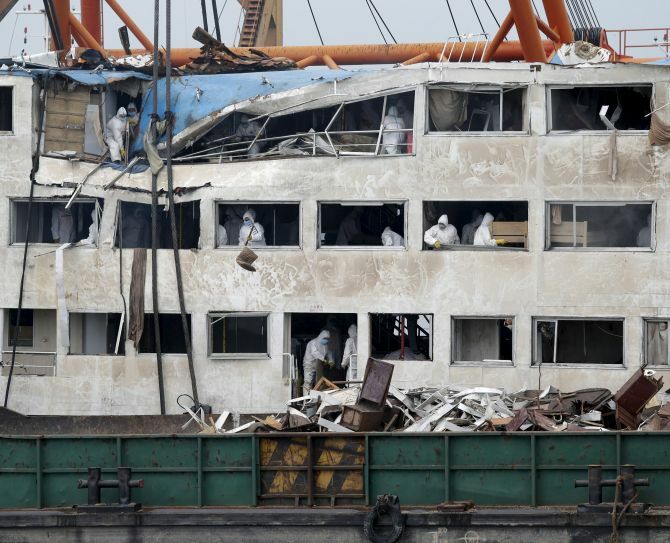 The bodies of two victims were recovered from the river on Monday morning with just eight of the 456 people on board the ill-fated vessel unaccounted for now, according to the rescue headquarters in Jianli, where the ship sank. The death toll in the tragedy had risen to 431 on Sunday evening and one body was recovered in the night. Fourteen people have been found alive so far. The Eastern Star cruise ship, carrying 456 people, was on an 11-day trip when it was overturned by a tornado in Asia's longest Yangtze River last Monday. More than 3,400 soldiers, 1,700 paramilitary personnel, together with 149 vessels, 59 machines and a helicopter, were deployed in the rescue mission. Authorities have attributed the overturning of the ship on sudden, severe winds, but have placed the captain and his first engineer under police custody pending investigation. The 76.5-metre vessel had been in service for nearly 20 years and can carry up to 534 people. It went through an annual maintenance in late 2014, and was qualified to cruise until April 25, 2016. The Eastern Star tragedy is China's worst shipping disaster in more than 60 years of Communist rule. Anywhere from 2,750 to nearly 4,000 people had died when SS Kiangya capsized off Shanghai in 1948.